Now, due to the ever-increasing popularity of monotype printing, Conrad is offering a line of large-capacity, portable tabletop presses. These presses break down into three parts to fit through standard 30" doorways. 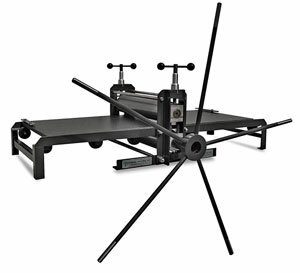 Features include a bed plate made of ¾" thick composite Benelex, 4" diameter solid steel upper and lower rolls (upper roll is spring counter-balanced), 4 ft diameter open direct-drive star wheel. They’re ideal for light pressure applications such as monotypes, woodcuts and linocuts, and can also be used as a small etching press. The micrometer gauge and stand are optional.